This entry was posted on November 13, 2012 by Jessica Anderson. Loving cup trophies are timeless and classic awards. This one is my favorite that we offer. How did this iconic trophy come to be? It’s hard to accurately pinpoint when loving cups became trophies, and the history around the origin of these awards is unclear. But what is known is rather interesting. Traditionally, loving cups are used in wedding ceremonies. Made of silver, these types of cups have two handles for passing from person to person. They date back to the 15th century, including the Celtic Quaich, and the French coupe de marriage. In ancient times, these cups were passed around banquets and used for toasts, and they are still used for this purpose at weddings today. Many couples share their first drink together as husband and wife from an engraved loving cup, symbolizing the joining of two families into one. But how did these glamorized drinking cups morph into the ideal trophy? The answer is unknown. Traditionally a “trophy” was something taken from one’s enemy – a piece of armor, a weapon, or sometimes a body part (ick!) – as a symbol of victory in battle. Cups as trophies don’t show up until the mid-18th century, but how did they raise to become the iconic symbol of achievement? One theory is that John Wesley (1703-1781), founder of the Methodist church, hosted ‘loving feasts’, where a cup of water was shared with everyone present. His cup had two handles making it easier to pass from person to person, hence the name ‘loving cup’. Maybe he went to a wedding for his inspiration? Who knows! But how did that loving cup become a trophy? The answer is a mystery. Since then, a cup as a trophy is the standard of excellence. Check out Wikipedia for more history of the Stanley Cup. One of the most famous cup trophies is the NHL’s Stanley Cup; it’s also the oldest professional sports trophy in North America. It was donated in 1892 by then Governor General of Canada, Lord Stanley of Preston. Awarded to the champion of the Stanley Cup Finals, this cup continues to be the highest honor in ice hockey. Other notable cup trophies include the African Nation’s Cup, the FIFA World Cup, the NASCAR Sprint Cup, the Cricket World Cup, the America’s Cup and the PGA Ryder Cup. It’s interesting to note that most of these awards are team awards, as it seems the original gesture of passing the cup from person to person has evolved into a symbol of team achievement. 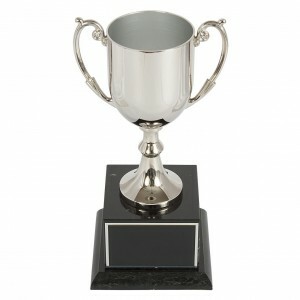 Do you want to honor your team with a loving cup? If so, we have many sizes and prices to choose between. Click here for a large selection of cup trophies. My favorite is the Brenna Loving Cup Trophy, because it is named after my daughter Brenna. It is a pretty shiny metal cup, with a black marble base; a classic and elegant choice. No matter which cup you choose, know that this type award has a long and mysterious history, steeped in tradition and lore. It’s also one of the most prestigious awards you can give, sure to make any achievement even more meaningful.